So, I've never been very into scrapbooking, even though I think scrapbooking looks cool. I haven't the desire to have more space occupied with little bitty pieces of materials. I have plenty of other hobbies that occupy floor space. Jude appreciates my restraint both financially and spatially. However, I came across Digi scrapping. This could be my downfall, as I already spend too much time staring at my computer screen. I have all the tools; it's not like it's a major investment, software wise. 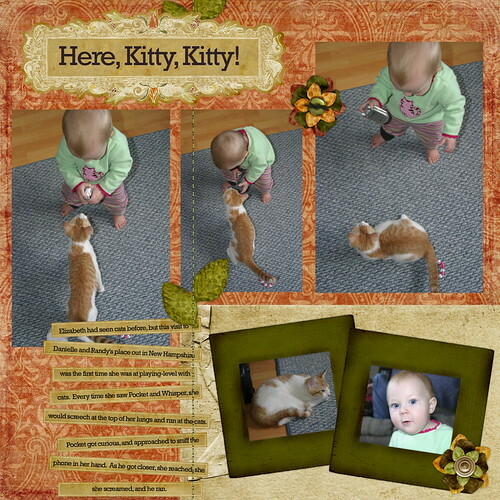 Today, I created my first scrapbook page. Although there are some things that I don't like about digiscrapping (sometimes it seems a little... uh... fake!) I appreciate the fact that it doesn't take up lots of space! Pretty good! Cute kitty, too. Carol does the same thing with our kitty, Simon. She squeals far more for the cat than anything else. Can you imagine what that was like in PetCo this week?